The gingerbread house we made just for "looking"
Would you let your kids eat this gingerbread house? We built this candy-laden bungalow from a kit, with the intention of keeping it until Christmas as a nice holiday decoration. But ever since we plastered it all together there’s been a spirited debate going on in our house about whether or not we should actually eat it. Parents’ view: No, it’s meant to be looked at and admired, not eaten. Besides, it won’t taste any good. It’ll be stale! Kids’ view: Let’s bash the thing and dig in! Sigh. 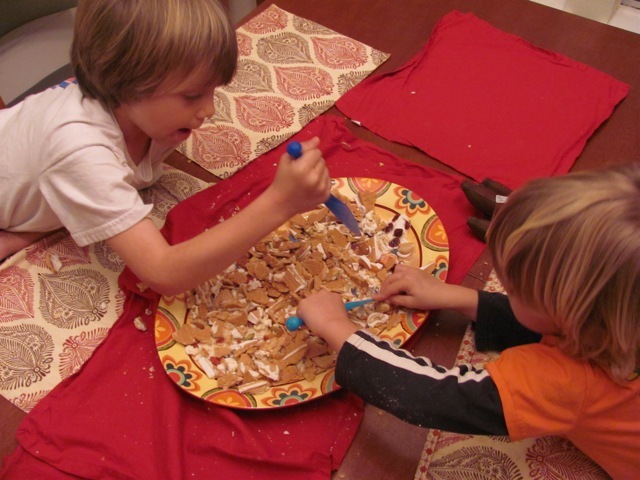 So we compromised by building a second gingerbread house – an “eating” gingerbread house, if you will. It still isn’t the healthiest thing in the world, but in terms of natural trimmings, it’s a world of improvement over the artificially colored candy-covered wonder that we made the first time around. 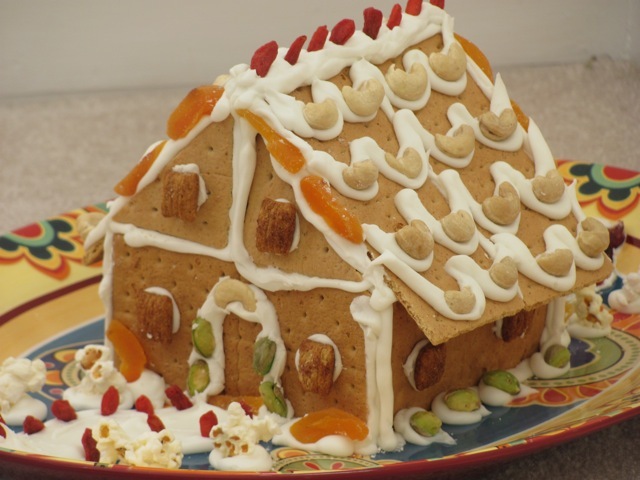 The “eating” house is constructed out of graham crackers and it is decorated with dried cranberries, dried goji berries, dried apricots, cashews, pistachios, popcorn, and cereal. It’s held together by homemade royal icing (see recipe below). Since royal icing frequently calls for raw egg whites, we made our version with Safest Choice pasteurized eggs — that is, eggs that are pasteurized in the shell so you can use them for regular cooking and baking without worries about salmonella or other bacteria that cause spoilage. This icing is designed to dry quickly – and hard – to create a firm adhesive for your walls and roof. 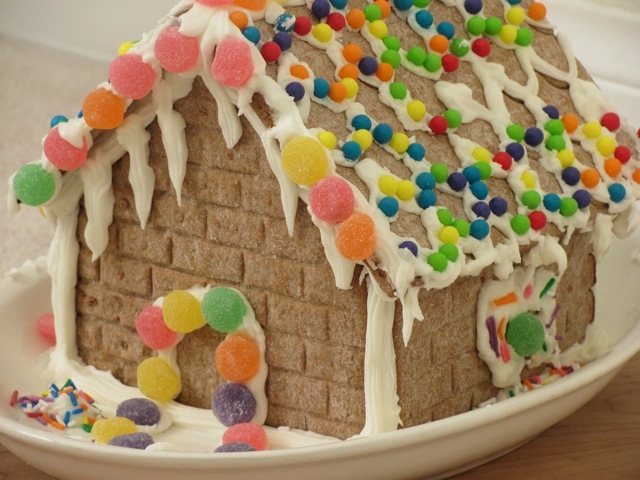 Want to make your own gingerbread house? You’ve got three basic approaches. One: Do what most people do and just ahead and buy a kit. But keep in mind that you don’t have to stick to the decorations that are in the kit. You can embellish your own design by adding your favorite dried fruits, nuts, pretzels, or popcorn. Heck, you can decorate it with your favorite expensive chocolate if you want. Two: Make it from scratch. We like this gingerbread recipe and step-by-step instructions from Disney’s Family Fun. This recipe avoids the problem of having the walls cave in by building the walls around a cardboard “inner house” created from a shoe box. We also like this pictorial step-by-step guide from King Arthur Flour. Hint: When you position the wall and roof pieces, hold them in place for at least a minute before letting go to make sure the pieces adhere properly. Also, don’t haul out the toppings until you’re ready for the final decorations; otherwise your kids will start filling themselves up with the toppings before any of it actually lands on the house. Three: You can combine the store-bought and homemade approach by using graham crackers as we did in our “healthy” house. The advantages: Graham crackers are already perfectly square for building, and they’re reasonably sturdy, so you can go crazy with the nut and cereal decorations when you’re ready. Oh – and just in case you’re wondering – there are very few things that are more fun than smashing a gingerbread house in preparation to eat it. Even though it’s the “healthy” house, this is still one happy demolition crew. Combine ingredients in a medium bowl and blend at medium-high speed until thick and creamy. Place the icing into a pastry bag and pipe it onto your gingerbread pieces to create a gingerbread house. If you don’t have a pastry bag, scoop the icing into a small plastic bag, seal the bag, and then trim a very small corner of the plastic bag to make an opening from which you can squeeze the icing. Use immediately. Makes enough to frost one small gingerbread house. Want to ogle some national-caliber gingerbread houses? 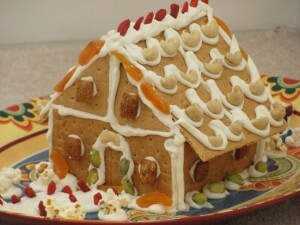 Check out the National Gingerbread House Competition in Asheville, NC. Also, if you live in Southern California, check out the Science of Gingerbread exhibit at the Discovery Science Center in Anaheim. They’re also having a gingerbread house contest, with entries on display through New Year’s. I love the idea of an “eating” house! Brilliant! And so cute! Thanks, Valentina – it was a hit! My husband made a gingerbread house from a kit a few years ago with the kids, but it did not look edible. Thanks for sharing the edible recipe! You’re welcome, Christina – Thanks for stopping by! Thank you for the idea for an edible Gingerbread house. We always make it, but never eat it. Definitely doing this with the family for our holiday gathering. I am totally with you, Eva! That’s what I keep telling my kids – You’re not actually supposed to *eat* those other gingerbread houses. But I have to admit that their absolute favorite part of all was smashing it to smithereens. Personally, not a fan of gingerbread, so just looking is fine with me! Aw…it’s OK…you could eat the graham cracker version! I hate the waste of gingerbread houses but your “eating” house looks like a great alternative! I am going to have to pin this! Thanks, Sharlene! It was a big hit with the kids! I’ve never even considered eating our gingerbread house. I like the idea of making one just to eat! Thanks! So funny! We’ve had that same conversation every day since we put our gingerbread house together. I told them they absolutely could not eat it so they asked if they could smash it after Christmas. I think we’ll go with your approach and make an edible one. Glad we’re not the only ones who are having this issue. Thanks, Yvonne! Like others who have commented, I,ve only ever attempted one with a kit. And even then, ours came out rather badly. I think I will just admire yours. BTW, I always wanted to make the Feast of Seven Fishes for Christmas Eve, even though I was never a guest in an Italian household for the holidays (I studied Italian and spent a month in Italy with friends whose family owned a hotel, but it was in the summer). What a fun idea! I love making gingerbread houses with my family this time of year!